On weekends, Aaron and I have a breakfast tradition that we always look forward to throughout the week. It involves a big stack of pancakes, most often with coffee, but recently with frothy almond milk chai lattes instead. Don’t you just instantly feel a little warmer and cozier thinking about it? My original favorite pancakes recipe is usually our go-to, and sometimes we switch it up and make apple cinnamon protein pancakes or nutmeg-spiced eggnog pancakes if it’s that time of year. 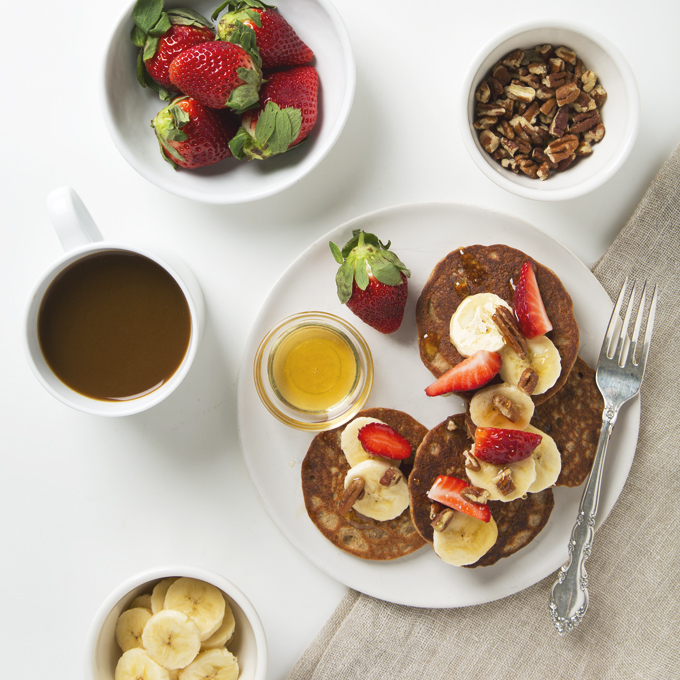 For the last few months though, we’ve been all about vegan banana protein pancakes. I think what has us both hooked is how simple and wholesome they are with only seven ingredients, no added sugar, and no protein powder (we get enough of that in our smoothies). 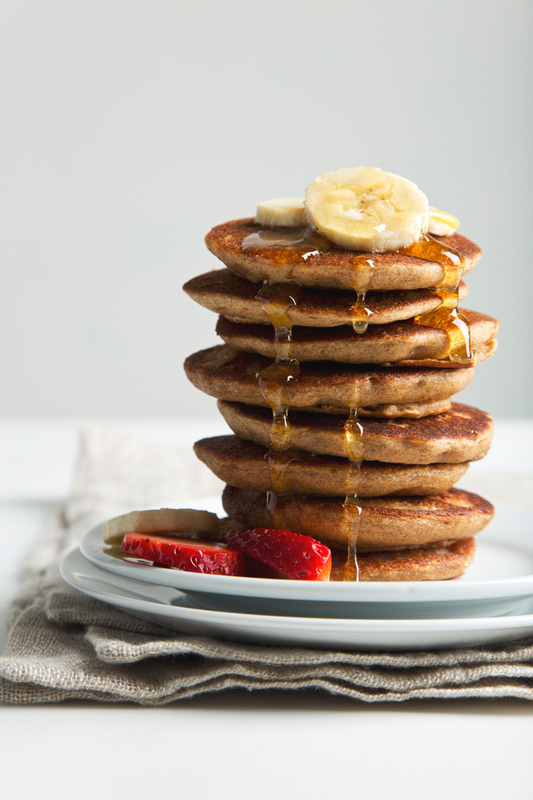 To make them, I swap all-purpose flour for gluten-free chickpea flour, throw in a banana, and mix up a quick chia seed “egg” for naturally sweet, fluffy pancakes that pack an impressive plant-based protein punch. 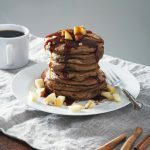 These banana pancakes will keep you full until lunch AND you can quickly mix up the batter in your blender to pour them straight into the pan! It’s a true five minute ordeal with very minimal dish-washing. 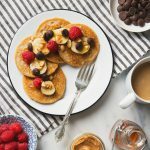 If you’re looking for a gluten-free, higher protein breakfast option, these 7-ingredient vegan banana pancakes are for you! They’re quick enough to make on busier weekday mornings, or they freeze really well if you’d prefer to make a batch on Sunday to enjoy throughout the week. Once frozen, just pop ’em in the toaster and you’re good to go! 7 ingredient vegan banana protein pancakes! Just 5 minutes to prep and 2-3 minutes to cook. 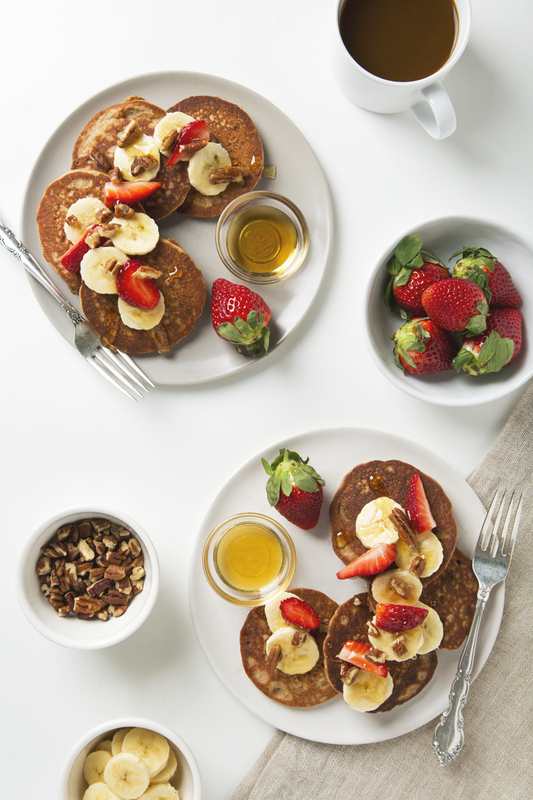 These pancakes are light, fluffy, slightly sweet, and pack in the protein thanks to chickpea flour! Prepare the chia egg by combining the ground chia seeds and the warm water. Set aside for 3 minutes to thicken. In a blender, add the prepared chia egg, non-dairy milk, banana, chickpea flour, baking powder, cinnamon, and salt. Blend until smooth. Heat a large, non-stick frying pan over medium heat. Lightly grease the pan with coconut oil and pour the pancake batter (about ¼ cup at a time) onto the pan, using a spoon to gently form the batter into a round circle if necessary. Cook the pancakes for 2-3 minutes per side. You'll know the pancakes are ready to be flipped when little bubbles form and hold their shape. This batter will be thick and fluffy. Add a splash more non-dairy milk to thin it out if it becomes too thick as it sits. To increase the protein even more, use organic soy milk as your non-dairy milk. Adapted from my Favorite Vegan Pancakes recipe. 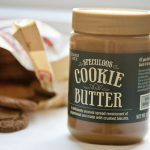 Ohh I have a bag of chickpea flour hanging out in my cabinet, so I’m all in for this! I think pancakes are in your future!! Thanks, Christina!! Let me know what you think if you give them a try! Done and done! I made them tonight for dinner (heh) for my husband and me and they were quick and easy to make, as you’d said. My husband ate his four pancakes before I’d even gotten through my second one, and he gave them what I think is the highest praise: “They taste like restaurant pancakes.” FABULOUS! Thank you : ) We will definitely be making these again. Breakfast for dinner is the best! I’m so happy you and your husband enjoyed the pancakes, Christina. Saying “they taste like restaurant pancakes” is such an awesome compliment—thank you! Great recipes as always. I would love to see the nutriention breakdown I count nutrients especially protein. THanks. Thanks, Michael! 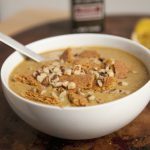 We don’t provide nutritional breakdowns for our recipes, but I’m sure there’s a free online nutritional calculator you could use to get exact numbers. Hi Michael. Try Cron-O-Meter, works wonders for vegans 🙂 These are fabulous and nutritionally superb too! These pancakes look super fluffy, perfect for soaking up syrup! I LOVE the fact that they are full of protein yet have no protein powder! It’s cold and dreary here today so these pancakes look like the perfect lunch. I’m so excited to try them! Perfect pancake weather! I hope you love the pancakes, Amanda! Hello! Do you think using golden flaxseed instead of chia would make a difference? A flax “egg” should work! Just make sure it’s freshly ground flax seed (I find the pre-ground stuff doesn’t bind nearly as well) and use 1 tablespoon of flax with 3 tablespoons of warm water. Thank you! I made these tonight and I had some issues but I’m not giving up on this recipe. Maybe you can help me, next time I will use chia as a binder to see if that affects the outcome. The flax egg binded great though, using warm water really helps a lot! The pancakes were very dense, not very fluffy and they didn’t “grow” when I cooked them in my cast-iron skillet. I could taste the “metal-ish” aftertaste of chickpea flour so next time I’ll try with another brand of flour as well. I had to cook for more than 3 minutes per side as well. Hi Diego! It sounds like a few things could be happening. 1) I would definitely try a different brand of chickpea flour. We recommend Bob’s Red Mill: http://amzn.to/2j24abx 2) You might need new baking powder. The batter and pancakes should be pretty fluffy since there’s a full tablespoon of baking powder in the recipe. 3) Make sure you fluff the chickpea flour before you measure it. It’s possible it was packed down and so you may have ended up using a little too much (which could make for dense pancakes). I hope this helps! Awesome! I’m so happy they turned out this time! These are awesome! I’m going to die if I hear one more person ask how a vegan can get enough protein. Keep up the good work!